Cambridge, 3 September 2018 — We are delighted to announce that we are the winners of the Seedcorn Funding Competition 2018/2019 – Round 1, a grant to carry out the investigation of our selective brain temperature management after TBI in collaboration with the Addenbrooke’s Hospital Neuro Intensive Care Unit. The project: Selective brain temperature management after Traumatic Brain Injury – a preliminary study to support the application to i4i funding, Dr Andrea Lavinio, University of Cambridge”. The purpose of the project is to fund a preliminary, proof of concept study of a new, localised approach to brain cooling for patients with or at risk of suffering neurological injuries. The investigation is going to be carried out in the Addenbrooke’s Hospital Neuro Intensive Care Unit, whose medical staff has provided the expert input during developing the approach and settin up the study. The project is 80% funded by the NIHR Brain Injury MedTech Co-operative and 20% by Neuron Guard to demonstrate the feasibility of our new approach. This study stems from the feedback of Research Design Service and NIHR to provide early stage demonstration of the feasibility of target brain cooling in patients with neural damage in preparation of a potential future application for funding a larger clinical investigation. 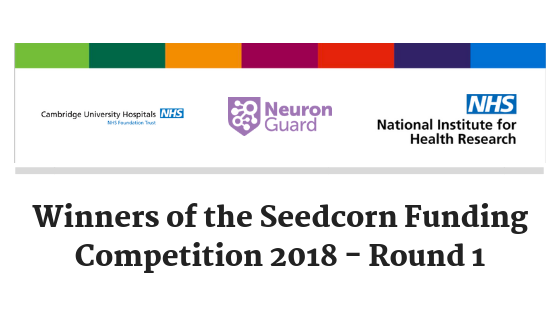 Seedcorn Funding Competition 2018/2019 – Round 1: The competition has been established to support early development of novel technology-based solutions applicable to the brain injury pathway, from prevention of the initial acute event through to longer-term rehabilitation. The Seedcorn awards of up to £10,000 aim to support proposals that are led by Academic Institutions, NHS Trusts, Third Sector Organisations and Small and Medium Sized Enterprise (SMEs). In addition, it fosters collaborative projects that have a near term clinical impact or the potential to secure further substantial funding after proof of principle has been established.